In honor of their service to the United States of America, Apologia happily extends a discount to active U.S. military families and disabled veterans of 40% off of the books and media products we publish. The Home School Foundation's Military Fund assists military home school families who are struggling financially to meet their children’s educational needs. Families where one or both parents are active, disabled, or retired from any branch of the military are encouraged to apply. Curriculum scholarships are given based on financial need and the availability of funds. If you are a military family that is struggling financially, feel free to get in touch with us to see if you are eligible. Or if you know a military homeschool family, please tell them about this new fund. 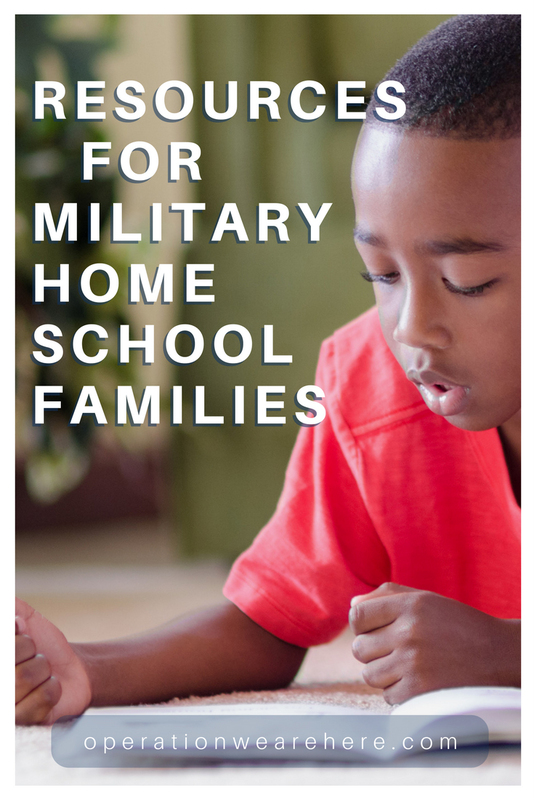 HSLDA has always supported military homeschoolers, but because of the efforts of the Home School Association for Military Families (HSAMF), they now recognize the need to be more directly involved in advocacy and support for military homeschool families. HSLDA has expanded to take on the efforts of HSAMF and will begin to focus on serving military homeschoolers directly. Home schooling means that you, as parents, assume responsibility for directing your child's education and use your home as the base for that education instead of a traditional public or independent school. Home schooling may appeal to some military families who are concerned that frequent moves and new school systems might disrupt their children's education. If you are thinking about educating your child at home or have already made the decision, the information here will help guide you to support and resources. Here are some resources for teachers, home school parents and others who want to teach children about the military. Includes various branches of the military, Memorial Day, and Veterans Day. Learn all about the history of Memorial day as you complete these twelve minibooks. Minibooks can then be added to your notebook pages or used to create a lapbook. Have fun learning about Memorial Day. In this mini study you will learn all about Memorial Day. In this mini study pack you also get: Copywork in seven fonts, optional lapbook cover and booklets for putting together your own lapbook, optional questions and one coloring page. Kids can do an online scavenger hunt that helps them learn about the history of Memorial Day. As I was putting together these Memorial Day printables, I realized I didn’t know the difference between Memorial Day and Veterans Day. It turns out that Veterans Day was established to as a way to primarily thank living military veterans. Memorial Day is a day for remembering and honoring military personnel who died in service to their country, particularly those who died in battle. This bilingual series is ideal for English Language Learners. It supports a key topic in the early social studies curriculum- our nation's holidays- and provides students with an introduction to United States history. Using lively, full-color photographs and easy-to-read text, each title explores a different holiday and explains why it is significant. Beginning readers will also learn how the holidays they celebrate in their families and communities are observed across the nation. This includes a full size Fact Reader that has Literacy and Math Activities that create a Booklet for each student to have. There are Writing activities, a Poetry Activity, A Mystery Phrase Math Activity, two brainstorming activities, several art activities, and a post card writing activity! We are blessed to be citizens of the United States of America. Our freedoms have been hard-won, in many cases defended to the death by members of our armed services. Veterans Day is a special day in the lives of Americans because it is set aside to honor the men and women who have fought for the freedoms we hold so dear. This project will serve as a basic introduction to the whys and wherefores of Veterans Day. Veterans Day! Sometimes this day is overlooked because of the hussle and bussle of the Thanksgiving holiday but don't forget about it on November 11th! This mini study will make it easy for your children to learn about Veterans day. In this study you will learn all about Veterans Day. This study includes information on Taps, comes with cards and pocket of America's wars, a bonus section about how Disney helped in World War II, copywork in seven fonts, optional questions, a maze and coloring pages. A professional CCSS Annotated Discussion and Activity Guide for The Poppy Lady is now available. You may download a PDF file. This holiday provides such an excellent opportunity to discuss our constitution and the freedoms our children might take for granted, while honoring those who have fought and lost their lives to protect them. Visit this LINK for coloring pages. Learn about aviation and the U.S. Air Force in our online Discovery Hangar! Enjoy the study of the United States Army with this special History Scribe in a new series about the American Military Forces. Help with your timeline studies. Includes over 30 pages to illustrate and narrate. All History Scribe Books include a couple blank pages for any special topics you'd like to cover. Teachers and Homeschool parents love our high-interest, hands-on curriculum including Lapbook Project Packs, Notebooking Packs and Thematic Unit Study Packs. With this unit study you will be able to teach your elementary, middle school and high school classroom all about the U.S. Army. The 1st Infantry Division of the United States, also called “The Big Red One,” is the oldest division of the United States Army. In continuous service to the United States since 1917, The Big Red One was named after its shoulder patch. Your student can complete a lapbook about The Big Red One with the U.S. Army 1st Infantry Division Project Pack from In the Hands of a Child. This 58-page pack includes a 16-page Research Guide and 20 hands-on activities about the mission, history, conflicts and wars, the patch, 1st Infantry Division band, song, monuments, and a brief biography of Colonel Robert R. McCormick.Help your students create an educational Lapbook while using our planning guide and answer key to make your lesson planning a breeze! Enjoy the study of the United States Marine Corps with this special History Scribe in a new series about the American Military Forces. Help with your timeline studies. Includes over 30 pages to illustrate and narrate. All History Scribe Books include a couple blank pages for any special topics you'd like to cover. Twenty themed handwriting exercises in three different handwriting scripts. A month of exciting copybook handwriting exercises for your own little Scribes! The simple handwriting sayings are all about the Marines... a great way to honor friends and family that are serving in our country's military forces... Lots of fun facts and information on the service. History Scribe helps your children to LOVE history studies. Children learn as they draw and write history...your children bring history alive with their own creative hands! Learn all about our U.S. Navy and the special people that make it all that it is. Weapons, machinery, famous sailors, special events and much more! Help with your U.S. History studies. Includes over 40 pages to illustrate and narrate. All History Scribe Books include a couple blank pages for any special topics you'd like to cover. Anchors Aweigh! Find out about one of the exciting branches of the U.S. Military in The United States Navy Project Pack. This 96-page Project Pack has all the tools you need to learn about U.S. naval history, Special Forces, ranks and much more! This Project Pack includes a 19-page Research Guide and 24-hands on activities. Iowa's Speak out for Military Kids youth created "Deployment: It's Not a Game" to increase awareness about the deployment cycle. As players move through the game, it serves as a tool to get them thinking and talking about the impact of deployment on military kids and families. Players are encouraged to identify issues military kids face during deployment, to reflect on how they might act in similar situations and to discuss how their school, community or organization might develop a plan to support military kids and families experiencing deployment. There have been at least four generations of military in my family, and at least three generations on my husband's side, including our daughter, who recently joined the U.S. Marines. This mini unit/lapbook is dedicated to the honor of all those who have served, and who are currently serving, in the U.S. military. It contains 4 cards for each of the 5 branches, as well as several other military pictures, and a brief timeline of the military. It could easily be used for a lapbook (no directions are included for that), for notebook pages, or just a mini unit on the Armed Forces of the United States. And one of the best ways to experience History Scribe is through our combo-packs! Get several of our popular E-Books together in one combination. Economical and a great way to cover all the resource needs for one historical period. Also you get a bonus book, A Happy Scribe Copybook with on Military Forces - 20 different writing copywork pages in 3 different handwriting fonts all with a military slant! Great for little boy reluctant writers! Facts about the five U.S. Military active-duty Services and their respective Guard and Reserve units. This is just a quick mini helper to learn a few facts about the U.S Military. 6 pages. Do you know the Air Force, Sailor's and Soldier's Creeds? Who are the Thunderbirds, and what military branch are they in? What is military time and how does it work? Discover fun and interesting facts about the different branches of the military. Learn about staying faithful to God in the military. Meet Staff Sergeant Charles Lawson and hear him describe his job in his own words. Examine the pay scale for Military personnel according to rank. Learn what it takes to become a member of the military. Find out what life is like for a military wife. Find out what military personnel promise when they recite their creed. Discover some of the interesting jobs available in the military.